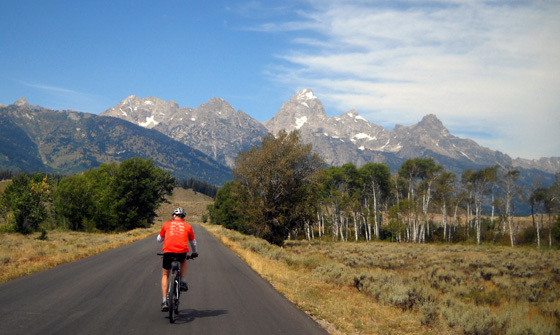 "The trail is a two-mile loop, crossing Savage River after one mile via a small footbridge. blowing from south to north (i.e., from the road to the footbridge)." 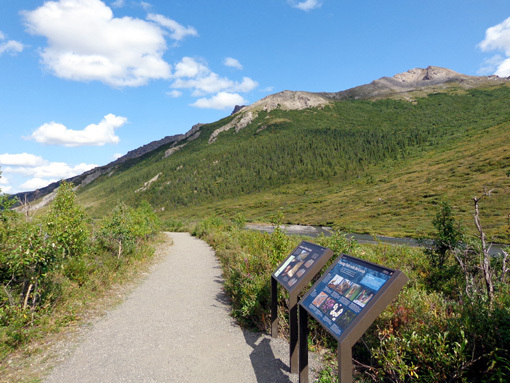 The wind was no problem on this warm, sunny afternoon through the canyon, my second hike of the day from the Savage River day use area at Mile 15.5 on the Denali park road. 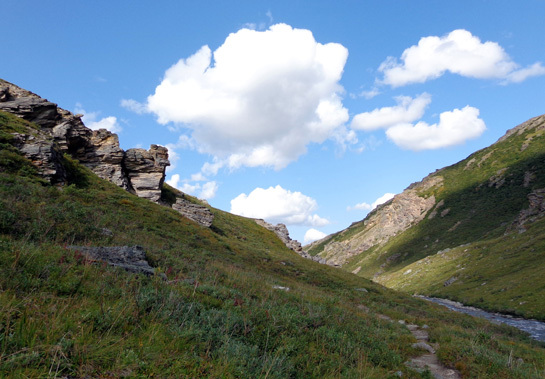 I described my first hike on the Savage Alpine Trail in the last entry. 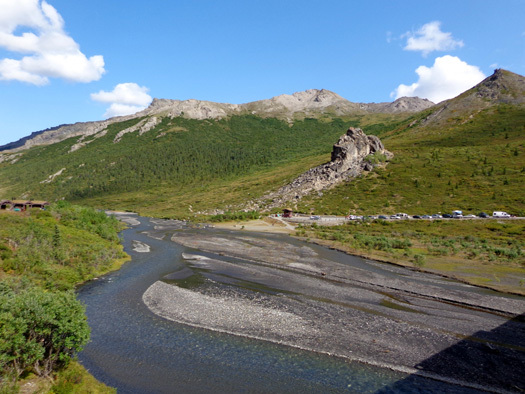 Since I was parked on the far side of the river from that trailhead I walked back over the vehicular bridge to the truck, first pausing to take some photos of a large bull caribou in the riverbed south of the bridge. I got even better pictures of another handsome male caribou (shown above) on the �gravel bar� section of the Savage River Canyon AKA Loop Trail, which was Hike #2 today. I started out on the west side of the river because that�s where the truck was parked. 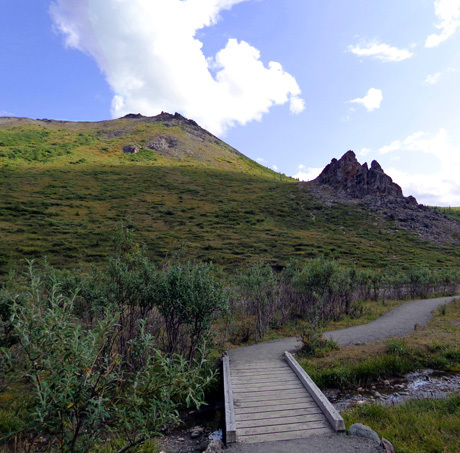 A hiker told me about a caribou on the little loop on the gravel bar but I didn�t see him because of willows. I did see him coming back an hour later, and forded the shallow river to get a better view on the east side of the river. I'll show more pictures of him at the end of this entry. 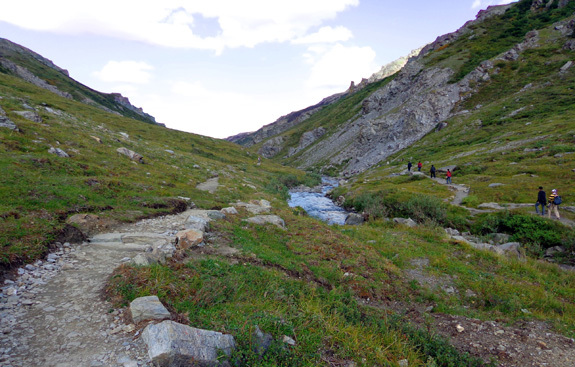 The two-mile loop trail has about 500 feet elevation gain and it is relatively smooth, compared to other single-track trails in the park. 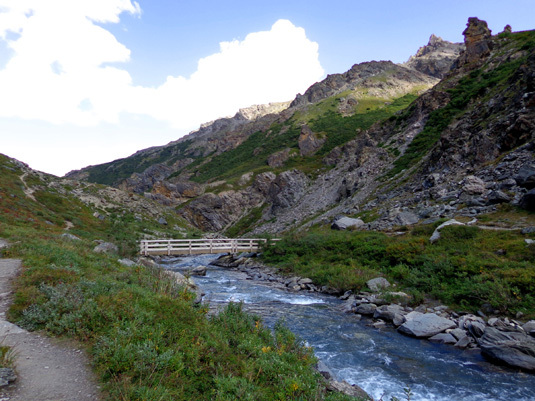 The trail goes out a mile on either side of the river, which is much more narrow through the canyon than it is at the road, and crosses on a footbridge. That's the basic loop trail that most people follow, or they just go out and back on one side of the river to avoid having to cross on the bridge on the park road -- or ford the river. 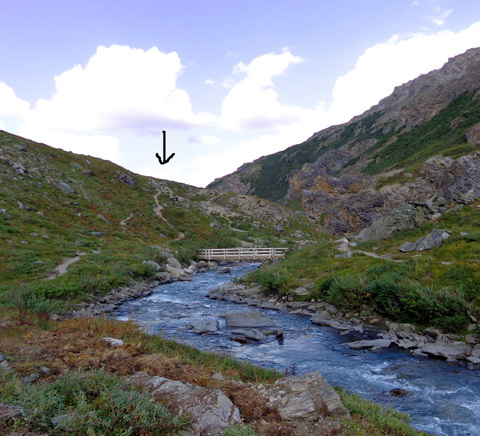 I'm more curious than "most people" so when I came to the footbridge and saw a rough trail (below arrow, next picture) winding up a slope I couldn't see over . 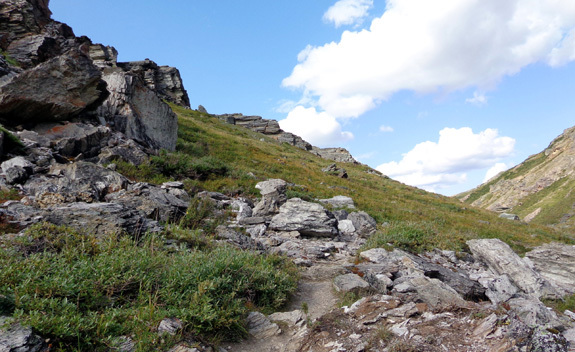 . .
Hey, the park encourages people to explore off-trail so that's what I did. I got more distance and elevation gain by going outbound 6/10ths of a mile past the bridge on a very rough trail that climbed higher above the river. 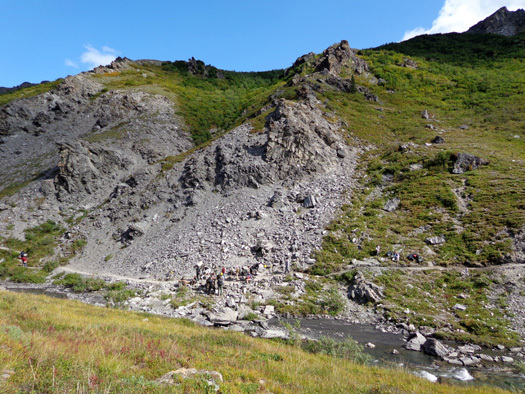 I came back the same way -- on the west side of the river -- and returned most of the way to the far side parking area before getting on the Savage Bar Trail (the little loop on the gravel bar in the diagram above) and crossing to the other side of the river to get better views of Caribou #2. I ended up with 3.4 miles in this hike. 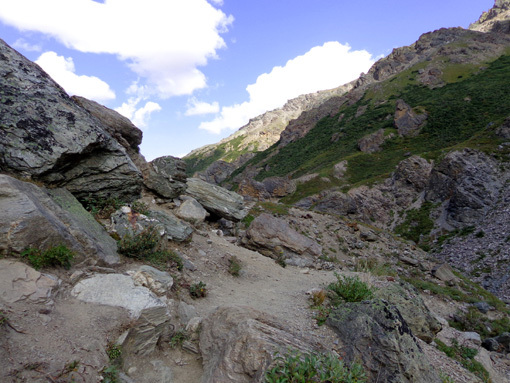 I'll present the remainder of the photos in chronological order out and back so you'll have more of a virtual tour of the trail. From either the east or west trailhead the riverbed narrows from quite wide at the parking areas to quite narrow within about half a mile. quickly the river narrows in the background. 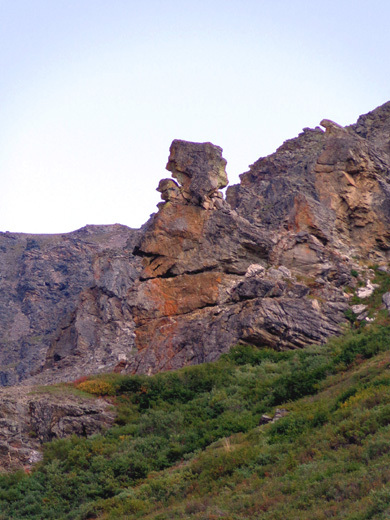 It's even more narrow farther into the canyon. and Mt. Margaret rises over 2,000 feet on the west (elev. 5,059 feet at the summit). 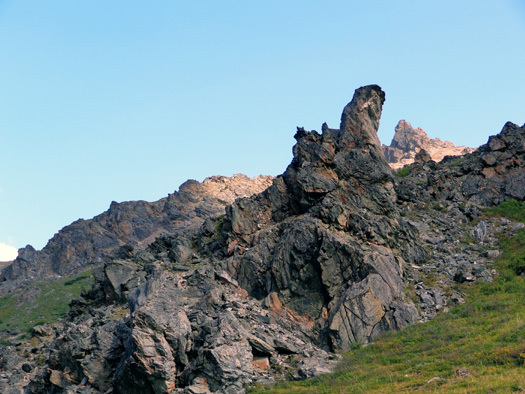 which you can't see here, are Savage Rock and one of the spiny ridges I hiked this morning. Beyond the gravel bar the river narrows considerably to just a few feet wide. 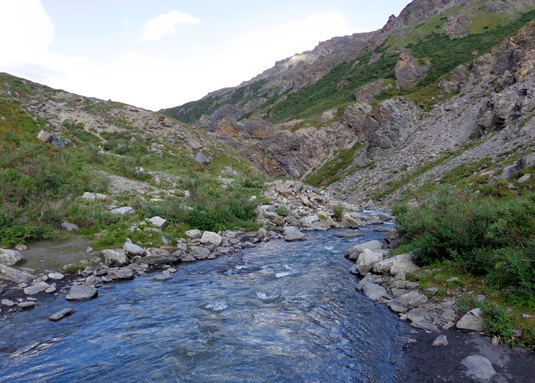 It is still fairly shallow and a beautiful blue color from glacial silt. 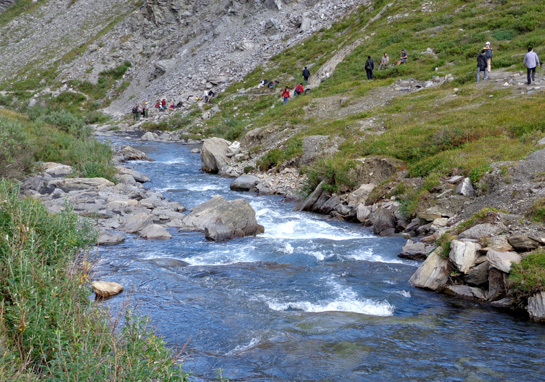 Like most streams the park road crosses, the headwaters of the Savage River are farther south in the Alaska Range. You can see the trail on the other side of the river most of the way to the footbridge. Even though the river is flowing downstream it is so narrow it looks more like a creek than a river -- kinda counter-intuitive, because it's still pretty shallow, too. 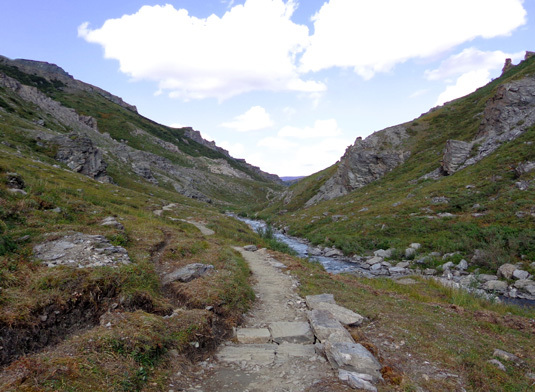 I wonder how much water flows through here when the winter snows melt. The trails are so close to the water in some places, they probably flood. Some parts have been relocated higher. 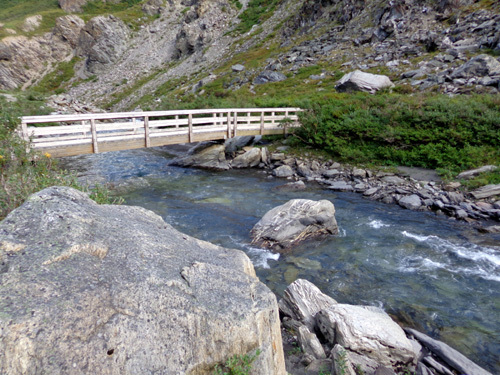 It's easiest to walk out and back on one side of the river so you don't have to cross the vehicular bridge at the road (like I did twice in my first hike today) or ford the river (like I did twice at the end of this hike). Both of those options were interesting, though. Parts of the trail on my side have already been located higher. 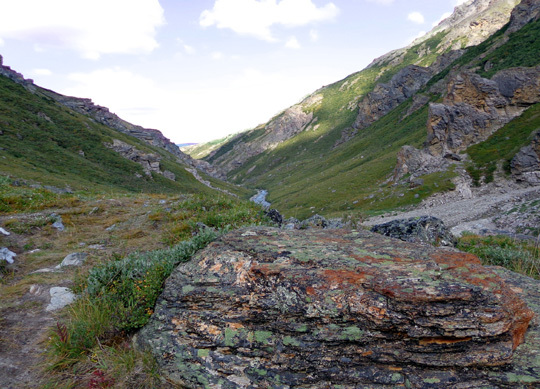 Hint to the adventurous: the rocks are even more interesting past the footbridge. 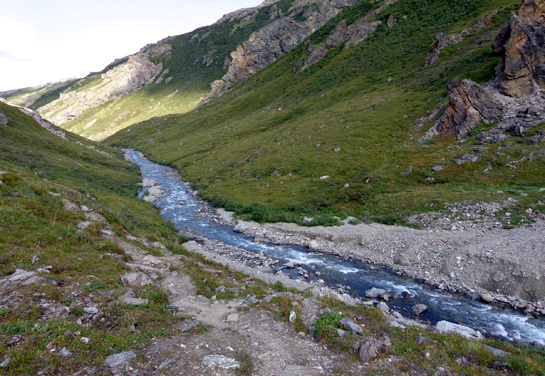 View of river looking northbound into canyon; un-maintained trail goes up slope on left. 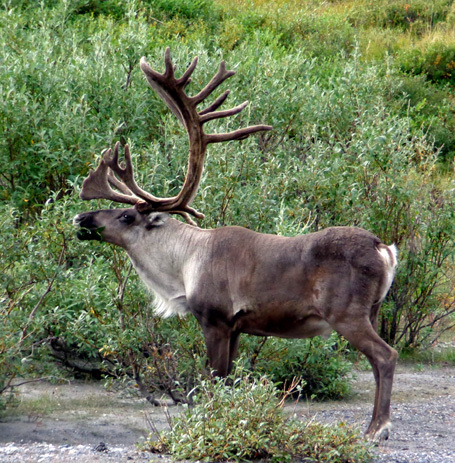 Photos continued on the next page (including several pictures of the caribou close up) . . .